If you have hosted a website in GoDaddy's shared environment you were probably used smtp.secureserver.net to send emails through a relay. On a VPS slice you cannot use smtp.secureserver.net since port 25 will be blocked. You do not want to use any email accounts as it will cause you to hit a 250 send limit per account. A relay is the answer and your VPS must be setup to use one. In order to send you first need to get the VPS relay smtp server name from GoDaddy. It may be different depending upon the IP address of your VPS. By default IIS 6 is not installed on the VPS Slice. You will need to install IIS 6 first. 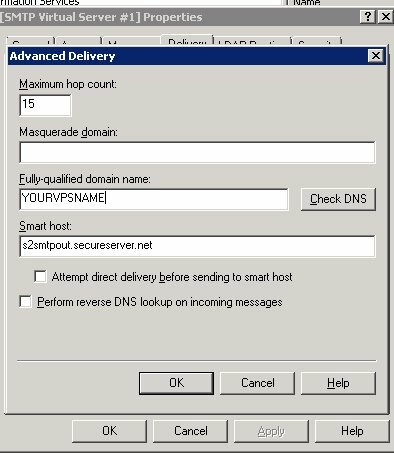 After installing IIS 6 click on the properties of the SMTP Server and the Delivery Tab, then click on Advanced. On the Advanced tab setup your server name and specify the SMTP relay as shown below. Verify the relay name with GoDaddy. This one may work for you but better safe then sending emails into vapor-land. Once you have this setup use localhost in your application as the relay. You do not need so specify a password, just connect with a valid email address used for your domain.